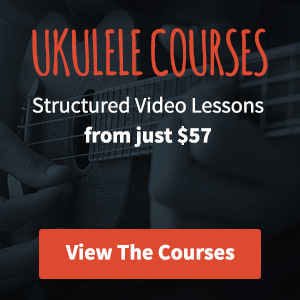 Are you finding that your new ukulele always needs tuning every time you want to play it? This is really common, particularly when you have new strings on your ukulele. Nylon strings take a certain amount of stretching before they settle down and hold their tune. Some strings will settle faster than others. Personally I like Aquila strings and Worth Browns. I haven’t noticed a huge difference in the stretching of the two but I’ve seen (and heard) some very poor strings at the cheap end of the market that seem to never really settle. Without doubt the best thing that you can do is play your ukulele a lot. The more you play the more your strings become accustomed to being plucked, pressed and bent. Don’t be tempted to pull and push the strings beyond how you would normally use them, try and keep it very natural. You might find that you don’t even get through a few bars before the uke has gone out of tune. Don’t worry about this, simply tune it up again and play some more. Keep doing this as much as you can. You’re going to speed the stretching process up significantly if you’re playing all the time. I’m not personally a fan of this method but there are some ukulele players that tune each string up a semitone overnight in an attempt to force the string stretches through. The reason I don’t like this method is that it’s unnatural, it’s not replicating how you will use the strings as you play, that said though – there are plenty of people that swear by it. If you’re new to ukulele then I think it’s pretty much a necessity to get your hands on a clip on tuner. They start at around £6 ($10) and clip right on to the headstock of your ukulele – the beauty of this is that they’re always there when you need them. I’ve lost count of the amount of tuners I’ve lost over the years that weren’t clip on. Although I generally tend not to tune with a digital tuner any more, I still think they’re a must buy. Finally, you should always tune your ukulele every time you pick it up to play it, you can also train your ear at the same time as doing this. Hopefully one of the solutions above will fix your problem! Aloha, my brother just sent me a new ukulele from The Big Isle of Hawaii. I haven’t played one since the 1970’s. I’ve played a little guitar through the years, but due to disease that effect my hands, I’ve played very little guitar. Re-enter an easy to play ukulele. >Why do ukulele’s always sound out of tune compared to guitar? I have new “Nylgut” strings so obviously I have to re-tune every song for now. However, even after tuning the ukulele sounds out if tune, to my non professional ear at least. Also it’s not an expensive ukulele, but it’s a good brand sent to me from my brother who is an daily and avid player of all things strings in Hawaii. Hey Tino, thanks for stopping by. Well you couldn’t have gotten a uke from a better place! Nylguts do take a bit of stretching and if they’re fresh on then it’s not that uncommon for them to keep losing their tuning particularly for the first couple of days. As for the uke sounding out of tune even directly after you’ve just tuned it up this could be a few things. A common issue that a lot of newcomers hit is tuning one of the strings an octave down. Technically it’s in tune but it doesn’t sound quite right. Hey there. I was just wondering about what I should do if my tuning peg goes backwards when I try to tune up to the standard tuning. I have a very aged ukulele, but it was given to me by a friend, and neither of us have played it in years. I don’t know if that’s the problem or if it’s something with the instrument itself. Anyways, I’d love to get an answer from someone who knows about this stuff. Hi Patrick, it could well be that either the tuning peg needs tightening or possibly replacing. What kind of tuning pegs are they?